Diana shares her many experiences with food allergies at multiple Disney properties in this fabulous guest post. We all want to see the world, right? And have experiences and memories, right? But when you sit in that room and your doctor says your kid (or you!) 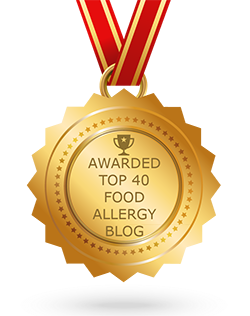 have a food allergy; the thought of travelling seems unattainable. At least that is how I felt when my son was diagnosed with a life-threatening peanut and tree nut allergy 5 years ago. I have found that Disney is the answer to how to safely travel and have the confidence to leave the house again. Walt Disney World is an amazing place to visit. The rides, the shows, the sights and the sounds are life-long memories for everyone. And then there’s the food, and yes, the food is an amazing part of any Disney vacation—yes, even those with food allergies. Walt Disney World is almost legendary in their service, including their service to those of us with dietary restrictions. 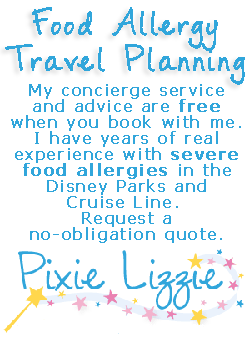 I know that many great ideas for managing your food allergies at Walt Disney World are on this valuable resource, Allergy Free Mouse, so I will not get into too much, just briefly run thought the main things to do. Make your dining reservations in advance, if you can. Mention your allergy when you make the reservation. They will give you a phone number to the restaurant to call the day before your reservation, you will also get a special needs form to fill out and they will send it to all the restaurants that you will be going to. When you arrive, remind them of your food allergy. Once you are seated the chef will come out to talk with you. We have had many chefs at different restaurants, come to our table and walk us through the buffets. They will also make certain items back in the kitchen and bring them directly to you to avoid cross contamination. That’s the only way my son gets a Mickey waffle, and he loves them. At quick-service restaurants, they have binders with allergen information in them, just ask for it. And don’t be afraid to ask for the manager or chef, they are more than happy to come up to talk with you. There are lots of different options for safe snacks, as well. Many are labeled, some are not, but if you are in doubt, just ask. They are very kind about it. Ok, so maybe you have Disney World down and you are ready to go someplace different? Let’s look at Disneyland in California first. Disneyland is very accommodating. There is not as much information online, like there is for Disney World but you can call Disneyland and ask them everything you want to ask. They are very helpful. And again, mention your allergy when making a reservation and be sure to return the special needs form. When you arrive, if you want to keep asking questions, great! Just stop in at City Hall and they can give you a list of restaurants that can easily accommodate food allergies. And just like Disney World, the chefs are more than happy to come out and speak with you. My family has been to Disneyland twice with nothing but great experiences with my peanut-allergic son. Disney’s Aulani Resort in Hawaii has the same policies…..and wouldn’t you know it, so does Disneyland Paris and Disneyland Tokyo. Mention your food allergy or dietary restriction when you make your dining reservations, fill out the special needs form and send it back, then speak to them at the restaurant and you will be good. Feeling like a cruise? Disney Cruise Line is definitely ready and willing to accommodate your needs. Just mention it when you make your reservation, mention it again when you board, and remind your wait staff at your first meal. You will have the same wait staff for the duration of your cruise, so you won’t have to keep mentioning it to people, which is always nice. However, you will need to mention it if you eat some places other than the main dining area but, again, they are pleased as punch to help you out. You can also bring food onboard, if that makes you feel a little better, as well. Adventures By Disney is an amazing vacation experience. Travelling the world with Disney’s adventure guides will give you a vacation that you could never have if you went on your own. However, they are a little different, since you are not staying within a Disney Resort with all the food controlled by Disney. However, I have spoken with them a couple times and they are more than happy, cheerful even, to work with their vendors to make sure that the food is safe for you or your family members. Seeing the world is back on my to-do list, food allergies and all, and I hope it is back on yours. We can travel and have amazing experiences around the world. Does it take a little more work and a few extra steps, yes, but that is ok to ensure a fabulous, safe vacation.